features continuously repeated to keep up with all calculations. and effective throughout your fitness journey. Perfect for any user's skill level. workouts! Large heavy duty plastic strap will keep you in place. Place the cycle on-top of a desk or table and you can even use it as an arm exerciser! Small finger grooves on the foot/handle grips for a comfortable fit. Compact magnetic pedal exerciser, The highest point of pedal is 11",can use with desk as low as 27", You can also pedal it forward or backward. 8-stage resistance level settings ,from very easy to more than you need,can be used both for starter and advanced users. 3" Large screen LCD monitor , shows SPPED, TIME, ODO, DISTANCE, CALORIES. Big fonts makes more easy to read. The monitor display or lock automatically when you use or don't use. Come with anti-slip pad, instruction book and installation tools, anti-slip pad can prevent bike from sliding when you pedaling. Only need 5 steeps to install all parts. 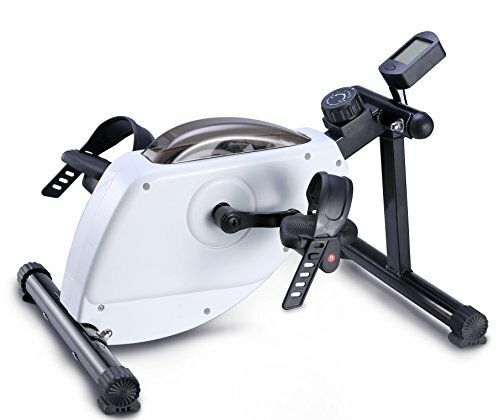 High quality exercise bike you can use it for a long time. If you have any questions about this product by EXEFIT, contact us by completing and submitting the form below. If you are looking for a specif part number, please include it with your message.